At Comfort Services, Inc., we can improve the condition of your crawl space and the living space above with products that are durable, long lasting, and made especially for the crawl space environment. Call us today to get a free estimate in Pinehurst, Southern Pines, Aberdeen and the nearby areas. We typically insulate crawl space walls with foam board insulation. This brings the crawl space inside the building envelope, which improves overall home energy performance. This will also help make rooms above the crawl space more comfortable and can help lower heating and cooling bills. Call 1-855-800-2275 or contact us online to schedule a free estimate for basement or crawl space insulation in Aberdeen, Pinehurst, Southern Pines, Garner, Apex, Fayetteville, Chapel Hill, Fuquay Varina, Fort Bragg, Durham, and the nearby areas. 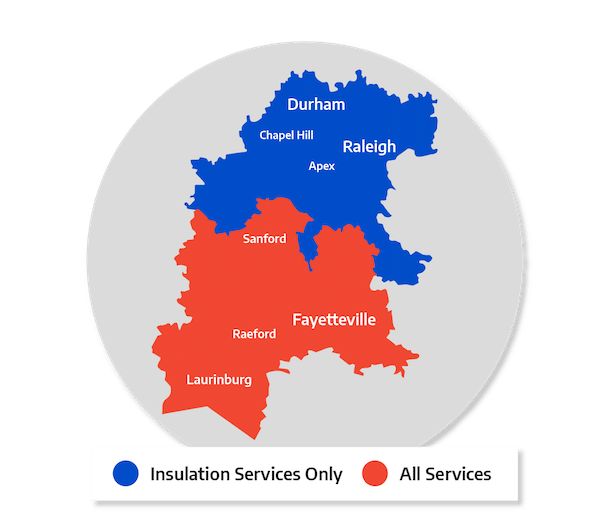 Comfort Services, Inc. is your trusted insulation company serving Central NC.